Really, I don’t. Cold potatoes just aren’t appetizing and adding mayo, mustard and/or vinegar does not make it better. But bacon does. I found that I do like loaded potato salad. And so does the hubs. As a matter of fact, it’s the only thing I make that he LOVES. Sad, but I’m not a very savvy cook. And he’s a very picky eater. 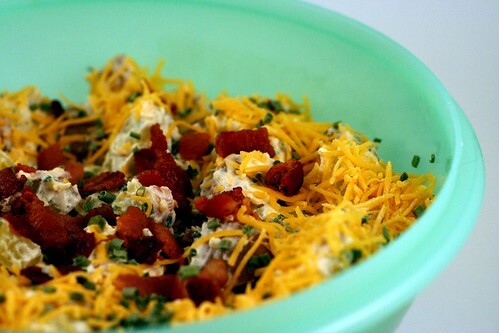 Behold, loaded potato salad. In my 40 year old Tupperware. So I thought I’d share my loaded potato salad recipe with the internet. Until I realized that I lost it. And that I never really measure the ingredients. But I believe it’s one of those recipes that you can just add however of whatever and come out on top. Scrub potatoes. If a little larger, halve or quarter them. Boil potatoes in the skins until fork-tender. Drain, dry, cool and cut into bite size pieces. Mix together sour cream and mayonnaise (I do 2/3 sc to 1/3 mayo). Add pepper to taste. Add cheese. Add bacon bits. Add chives. Stir it up all nice like. Combine creamy goodness with potatoes. Top with a little more cheese, bacon and chives. Refrigerate until chilled. Consume with a big smile on your face. Sometimes I use a 3lb bag of potatoes. Other times [when I know that it will be gobbled faster than a Thanksgiving turkey] I use a 5lb bag of potatoes. And adjust everything to make it snazzy. You can’t mess this up. And believe me, I know how to mess stuff up. And, as the old adage says, bacon makes everything better. ~ by shutterboo on April 2, 2010.
ps. loving the new header. Ich esse gern Kartoffelsalat. Make sure and pass this message along to Hubs. Great seeing you guys tonight! Hope bowling is/was awesome. I made your artichoke dip last night. Six adults milling around and an hour later it was gone. I licked to corning ware – none was spared. I made macaroni salad this week and was planning potato salad as my next move. I’ll try a slight vegetarian variation of this next instead. Thanks!